Stephen Colbert's tenure on "The Late Show" began Tuesday night with a tribute to his predecessor David Letterman and a visit from an old friend. The premiere episode began with a pre-taped piece of Americana, a scene at a ballgame with the Star Spangled Banner being sung by Colbert. This is when Colbert revealed the biggest special guest of his debut episode. When the umpire took off his mask, it was revealed to be Jon Stewart, Colbert's old Comedy Central colleague, who said "play ball." Related: Stewart is an executive producer of the "Late Show"
This led to Colbert -- in a light blue suit -- running out on stage with his band leader, Jon Batiste, as his audience chanted "Stephen! Stephen!" "Hello, nation," Colbert greeted his audience. "Well, folks, if I knew you were going to do that I would have come out here months ago." 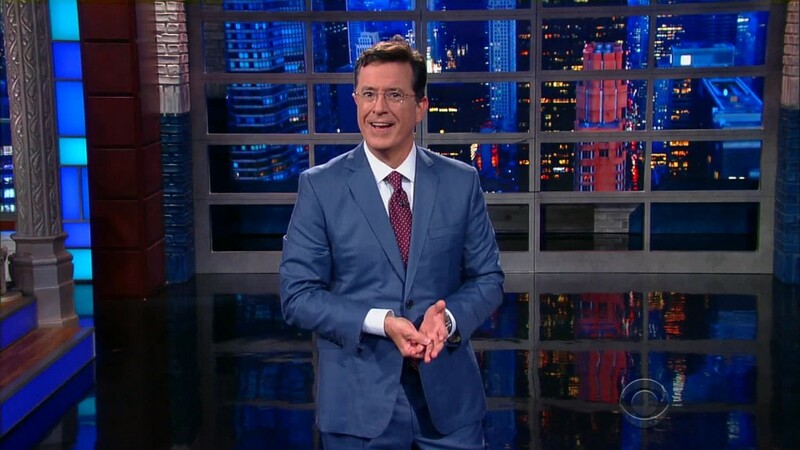 In the overnight ratings, Colbert's "Late Show" was easily the #1 talk show of the night. Colbert's first two guests were George Clooney and Republican presidential candidate Jeb Bush. While critics had mixed feelings about Clooney's appearance, they had lots of positive things to say about Bush, who played along with Colbert at every turn. Colbert also asked him a serious question: "In what ways do you politically differ from your brother, George?" After Bush joked that "I'm obviously younger, much better looking," he also said the former president should have been more conservative on spending issues. "He didn't veto things, he didn't bring order and fiscal restraint," Bush said. In his Late Show debut tonight, Stephen Colbert tells us: "I used to play a narcissistic conservative pundit. Now I'm just a narcissist." Those in attendance said the renovated Ed Sullivan Theater, with its stained glass windows and a majestic dome, had the feeling of a church. While showing viewers around his new set, Colbert got a video message from one of his late night competitors, Jimmy Fallon, who wished him luck and said, "see you in the locker room." The premiere is a huge moment both culturally and, for CBS, financially. "The Late Show" is an American institution thanks to David Letterman's two decades of steady hosting. Colbert praised Letterman when the taping began and said he doesn't want viewers to think he's "replacing him." "We will try to honor his achievement by doing the best show we can," Colbert said of Letterman. "And occasionally making the network very mad at us." He also said during his opening monologue that the nightly "Late Show" would help him figure out his true personality -- as he retires the faux conservative commentator he played on "The Colbert Report" for so many years. "With this show I can begin the search for the real Stephen Colbert," the host said. "I just hope I don't find him on Ashley Madison." The host and his viewers will "discover the 'truthiness' of the real Colbert together," said audience member Ankur Butala. Another member of the audience, Alex H. Nagler, said "it's still very clearly him, but more human, if that's the right word." CBS executives including CEO Les Moonves were on hand for Tuesday's show. Moonves joked with Colbert by placing his hand on a switch that would return CBS' late night to reruns of "The Mentalist." With Colbert, 51, taking over, the network hopes to attract younger viewers and the advertisers who crave them. The debut marked the end of a long summer of preparations by the comedian and his team of writers and producers, many of whom came with him from Comedy Central. And it marked the first "Late Show" performance by the show's new house band, Jon Batiste and Stay Human. The new "Late Show" has an eclectic guest list, perhaps reflecting Colbert's desire to have serious conversations along with the requisite late-night silliness. Along with Clooney and Bush, guests will include Vice President Joe Biden, Supreme Court justice Stephen Breyer, and Tesla Motors CEO Elon Musk. "The goal is to have fun with my friends," Colbert told "CBS Sunday Morning" before the debut. "And that means sometimes talking about things that you care about." It also means the so-called Colbert Nation -- his fans from Comedy Central -- will see who he really is. "I hope they'll find out pretty quickly that the guy they saw for 10 years was my sense of humor the whole time," Colbert said on Sunday.